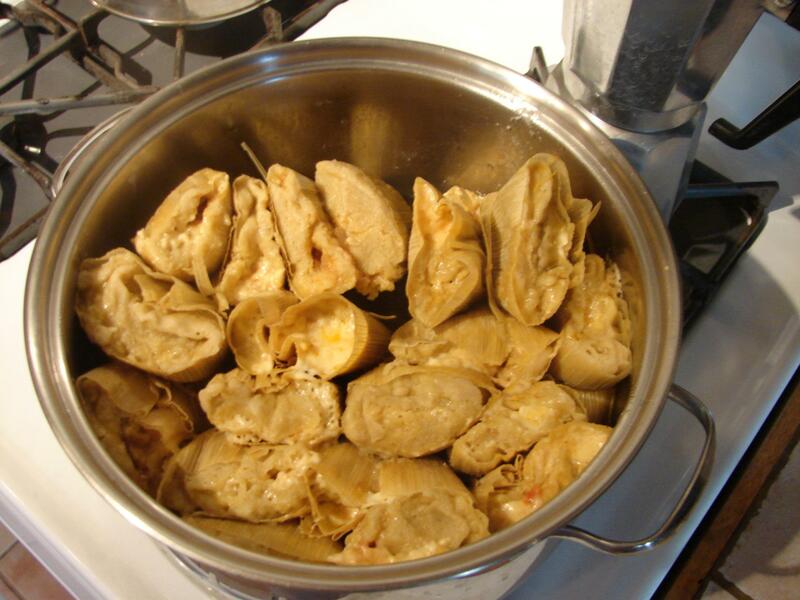 Originally I came up with this recipe for New Year’s Day but I think it would be a great anytime appetizer. And well, there is a big appetizer “holiday” coming up, you know. It’s called the Super Bowl! And it’s only two weeks away. We don’t “celebrate” the Super Bowl but I think this would be a great addition to anyone’s lineup this year. And of course this makes a great New Year’s Day “good luck” dish too, since it contains black-eyed peas. (Which is how this recipe originally came about, I was looking for a new way to eat our New Year’s Day black-eyed peas.) I think pinto beans would also be great and even more “New Mexican”! Preheat oven to 350 degrees. Place beans in a mixing bowl and mash lightly with a fork. Stir in the onion and green chile. Add sour cream, cumin, garlic powder, salt and pepper and cheese. Mix well. 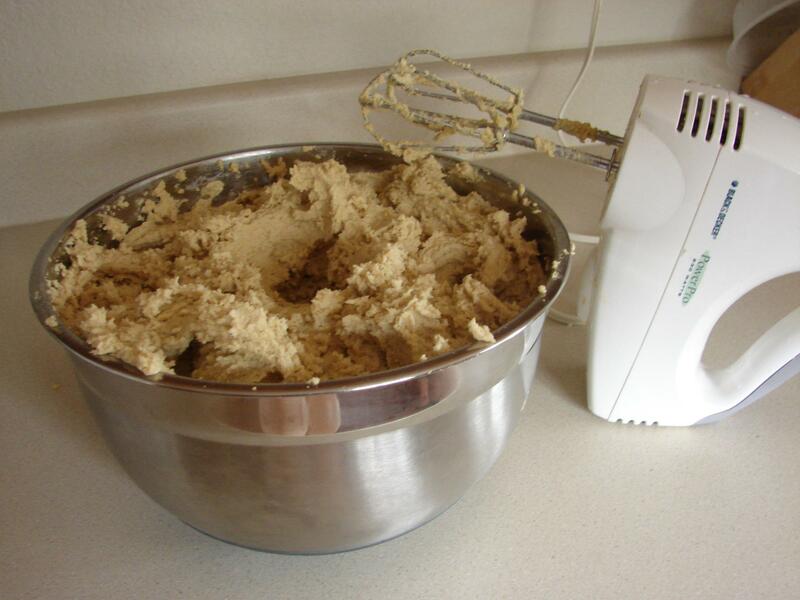 Spread into 8″ square baking dish and bake for 20 minutes or until bubbly and beginning to brown on top. Top with chopped tomato and cilantro. Serve with tortilla chips. * Any kind of beans would work; pinto beans would be especially New Mexican! We’ve only lived in New Mexico for a few years now. And before we moved, I knew virtually nothing about the state. But now I know one thing, they are passionate about their food, in particular their chile. In fact, the official state ‘question’ is: Green or Red? This of course, refers to green or red chile sauce. And no, it’s not ‘Texas’ chili with an ‘i’, that’s a soup or stew (I’m not going there, Texans! ); it’s chile with an ‘e’, as in chile peppers. You’ve probably heard of Hatch green chile and you’ve probably seen little cans of chopped green chile in the Hispanic foods section of your grocery. And to be honest, I had never really used them much. After moving here, that had to change, as everyone asks you which is your favorite, red or green, and you had better have an answer! Unfortunately, the green and red chile sauces that are slathered over burgers and omelets and enchiladas and everything else, at the restaurants around here, are frequently made with flour. You should always ask. Sometimes the green chile sauce is made with cornstarch instead of flour. It’s even rarer to find a red chile sauce made with cornstarch. So for a couple of years, I had never eaten red chile sauce, not being adventurous to make my own. Last year though, a co-worker of mine mentioned she was making red chile enchiladas for another friend of hers with celiac disease and I mentioned that I had never eaten red chile before because of the flour issue. The next week, she brought me some for lunch as she had made the red chile with cornstarch and had decided that she preferred making it that way as compared to with flour. They were wonderful! So, you’re probably asking, which is her favorite? I have to say that I like green better but maybe that is just because that is what I am most familiar with. And so recently, at our local Costco, they were selling huge jars of the 505 Roasted and Diced Green Chile (blue label). Of course I bought some, and every time I’ve been there since, and then I got to thinking about what I wanted to make with it (and all the other jars in the pantry now!). And since you all know I have been on an enchilada kick…here it is. Fill a large pot with water and bring it to a boil. Add potatoes and cook potatoes until ‘al dente’ (Can you say that for potatoes?). Drain and reserve. In a large skillet, saute the onions with a bit of oil. When they have softened, add the garlic and saute a minute or so longer. Stir in the spices and cook for a couple more minutes, stirring frequently. Then mix in beans, potatoes and 1/2-1 cup of green chile. Taste and add more chile if desired. (Some batches of chile are hotter than others. So depending on who you are feeding and their spice preferences…). I added 1 cup of chile to this batch. Heat through, stirring occasionally, for about 5 minutes. Then turn off the heat and stir in 1 + cups of cheese. Preheat the oven to 375. Grease a couple of large baking dishes. Spread some green chile in a shallow, wide plate or bowl. Heat a small skillet, with a little drizzle of oil. Heat the tortillas, one at a time, flipping them over, until pliable. (This is key! 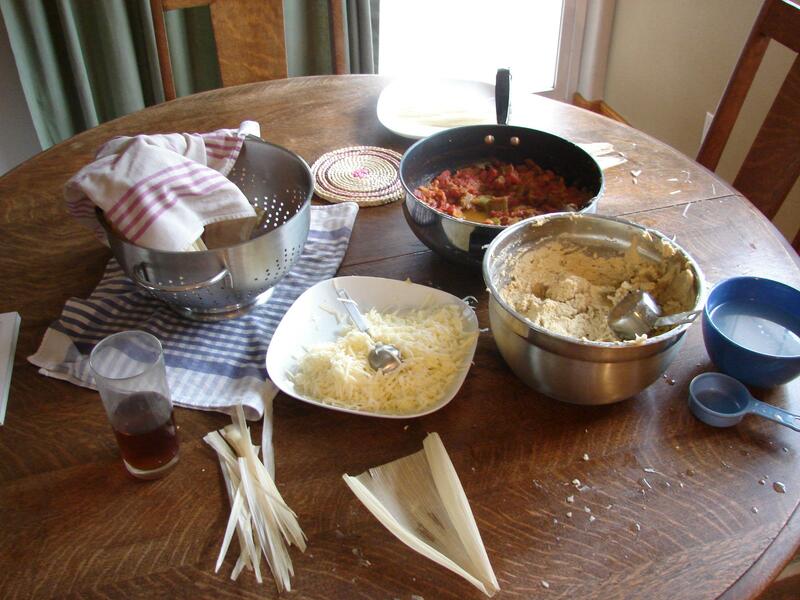 Otherwise your tortillas will break when you roll them!) Add more oil as needed during the process. Immediately turn the tortilla into the green chile and rub the chile all over both sides of the tortilla. 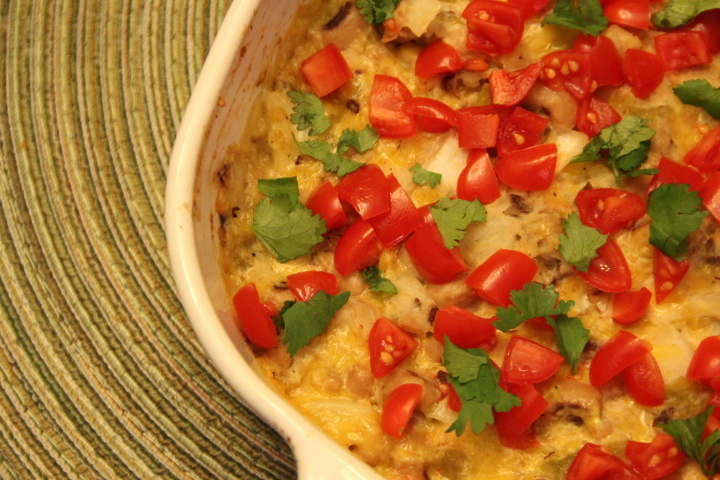 Place tortilla in baking dish. Add filling (not too much!) and roll up, placing the seam side down in the dish. 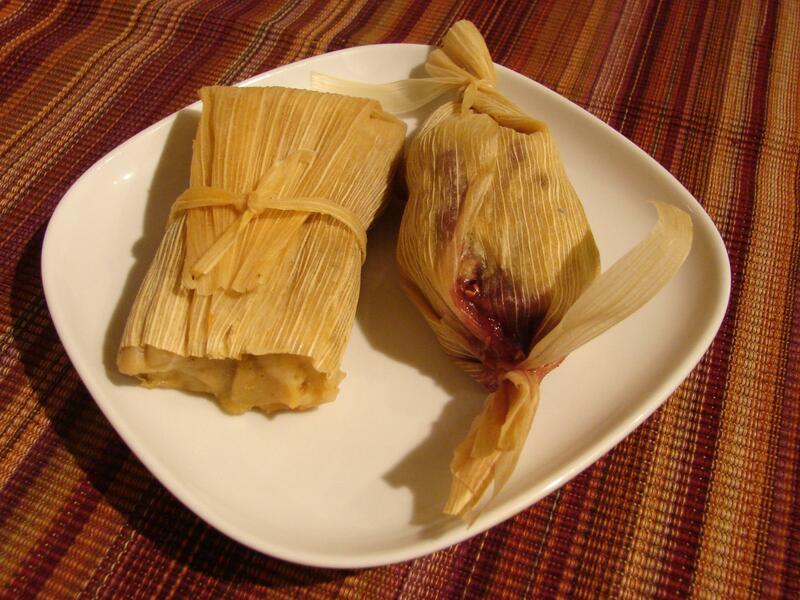 Continue with remaining tortillas and filling. 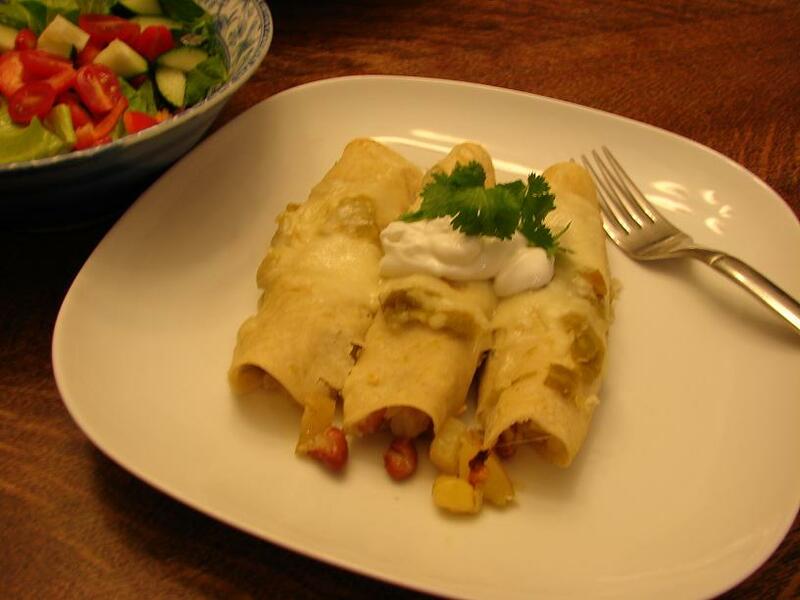 Spread additional green chile over top of enchiladas and sprinkle with additional cheese. Bake for 20 minutes or so. Serve with sour cream to cool your mouth! You could also omit the green chile in the filling and make Karina’s quickie green chile sauce (and her enchilada recipe is wonderful too!) and pour over the top before baking, then top with cheese. This would be a more traditional style of enchiladas, baked with a sauce. Please note that the name of this restaurant has changed to La Cueva Cafe. Same location, same owners, same ability to accommodate gluten free! I will apologize now, I did not take any pictures of our wonderful food. Last week we drove up to Taos for the day with my in-laws and my mother-in-law brought a tour book with her. She was reading it as we traveled and she discovered that Rellenos Cafe could do gluten free and vegan food! Woo-hoo! Perfect for us! So it was our first stop to refuel before heading to the Pueblo and the plaza. Rellenos Cafe is located at 135 Paseo del Pueblo Sur, right on a corner. But be careful because you can easily pass it by as you go up the hill traveling north on Paseo into the central part of town. It is in a fairly nondescript building on the right just before you pass the old traditional plaza and it says “Wheat Free and Gluten Free” in big yellow letters on the front window. It is a very small place that looks almost “dive-y” with only a couple of parking spaces in the asphalt lot out front. But be sure to go in, you’ll be happy you did. Despite the looming possibility of a summer thunderstorm, we chose to sit out on the cute little patio surrounded by coyote fence and gardens beyond. Partly because it is very small inside the restaurant, we’re talking like 4 tables and they were mostly full, but also because it was still nice outside and we had been in the car for a couple of hours. The patio was a little loud at times with big trucks clambering up the hill on the main road just beyond but it wasn’t too bad. I’ll definitely chose to sit on the patio again. Right off, I mentioned to the waiter that I required a gluten free meal and he said that it was no problem, he would help me out. And right after he got our drink order taken care of, he did just that. He was very familiar with the entire menu and what was safe and what was not. He even stated that they would make things in a separate pan for me, without being prompted. He answered all my questions to my satisfaction and I felt totally taken care of. My husband ordered the Cheese Chile Rellenos and I asked the waiter to make that dish gluten free as well (separate pan) so that I could taste them. Both dishes were delicious. Enchiladas are typically stacked (layered) here in New Mexico, instead of rolled, and these were no exception. They were filled with shrimp, lobster and crab meat and smothered in a wonderful chipotle cream sauce and cilantro. On the side was pico de gallo, rice and pinto beans. The pinto beans were perfectly cooked too, they were nice and firm and not at all mushy. No refried beans here! (Although I do like refried beans.) The beans were wonderful with the extra cream sauce. Also, both their red chile and green chile sauces are gluten free, which is rare, typically they are made with flour. Our server was kind enough to bring some additional chile out and I enjoyed some of the green chile on my beans also. Yum! Just as we were finishing our meal, the sky finally opened up and we escaped into the restaurant to wait out the gully-washer of a storm. While waiting, my family ordered some sopaipillas, which are not gluten free. Apparently they were delicious too. Back to the food. The entrees are reasonably priced. We were there for a late lunch but I believe the same menu is in effect for both lunch and dinner. Full entrees ranged between $7-$13. 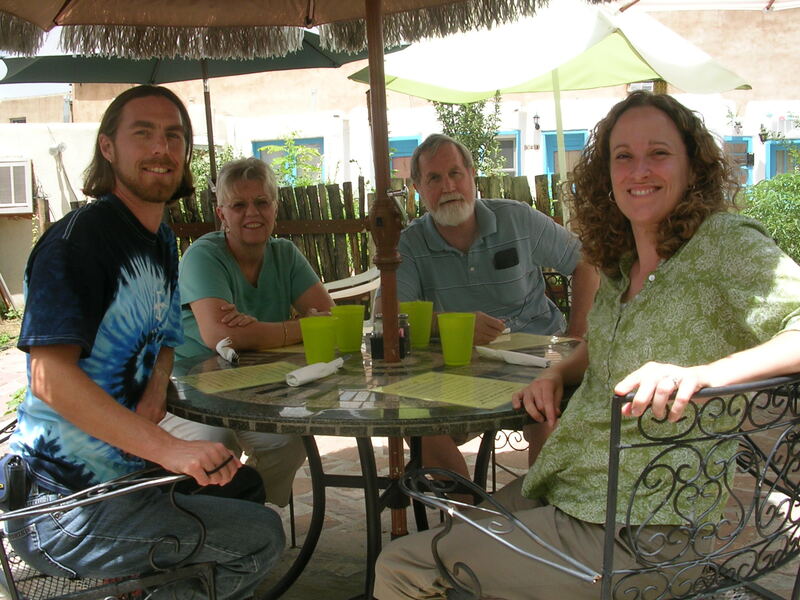 So, if you happen to be visiting Taos, be sure to stop by Rellenos Cafe. I know we’ll be back!